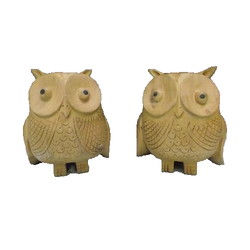 With sincerity and hard work of our professionals, we have carved a niche for ourselves in this domain by manufacturing and supplying Wooden Carved Owls. Under precious guidance of our professionals, we are involved in offering a broad spectrum of Decorative Wooden STATUE. Our offered wooden STATUE are precisely crafted utilizing quality assured raw material and best tools according to the market trends. We provide these wooden statues in different customized form in terms of patterns, sizes and colors. Our organization is involved in manufacturing and exporting a exotic collection of Wooden Jali Owl. Owing to unmatched quality and fine finish, our products have gained wide appreciation from clients all over the world. Moreover, we welcome our clients to provide us with drawings and designs. Fine Decorative Wooden Undercut Work Owl Tree Available In Different Designs & Sizes. Handmade with highly skilled and precise craftsmanship of 'jaali' work carving on wood, with a smaller owl inside the bigger one. Made of fine kadam wood. Owls holds imsportant significance in Feng Shui and Vaastu belief systems and are universal symbols of wisdom and vigilance. In order to retain our goodwill in this industry, we are providing a qualitative array of Wooden Handicraft Owl. Keeping in sync with the latest market norms and policies, we are indulged in providing a high quality range of Wooden Owl. Due to our years of expertise in this realm, we are readily engaged in presenting an exceptional quality variety of Wooden Handcrafted Owl.